The Bible Gateway: NIV([^<]*)">, NASB, CEV, The Message, KJV, etc. "Mission and Message," "Receiving the Sender," "Kingdom and Repentance," The Jesus Database, an online annotated inventory of the traditions concerning the life and teachings of Jesus. Dr. Gregory C. Jenks, FaithFutures Foundation. time: for here that solemn preaching of the gospel, which was used afterward when the Churches were settled, is not instituted: but these are sent abroad to all the coasts of Judea to show them that the last jubilee is at hand." "The ministry of the gospel calls men to receive Christ as a Prince and a Saviour; and he will surely come in the power of his Spirit to all places whither he sends his faithful servants." "Rejoice not so much that the devils are subject to you, as that your names are written in heaven - Reader, so is thine, if thou art a true, believer. God grant it may never be blotted out!" "The mission, unlike that of the Twelve, was evidently quite temporary. All the instructions are in keeping with a brief and hasty pioneering mission, intended to supply what of general preparation for coming events the Lord's own visit afterwards to the same "cities and places" (Lu 10:1) would not, from want of time, now suffice to accomplish; whereas the instructions to the Twelve, besides embracing all those to the Seventy, contemplate world-wide and permanent effects." "The victory of his disciples over the demons is the harbinger of another fall, when Satan and all his works shall be destroyed." Commentary, Luke 10:1-11, 16-20, Mikeal C. Parsons, Preaching This Week, WorkingPreacher.org, 2016. "Luke 10:1-24 records the mission of the Seventy(-two) and its aftermath." "The Ongoing Mission of the 70," David Lose, In the Meantime, 2016. "The Security of Seventy," Karoline Lewis, Working Preacher, 2016. "Leadership as communal means the constant realization of the public nature of leadership for the good of the whole." Provocation of the Gospel, Richard W Swanson, 2016. Commentary, Luke 10:1-11, 16-20 | Mark Quanstrom | Dean of the STCM, ONU; Pastor, College Church University Avenue | A Plain Account, 2016. ""I'm thinking that if I were to preach from this passage, I wouldn't be preaching to the congregation so much as simply allowing them to eavesdrop on a message I would be preaching to myself."" "The Politics of Bringing Peace," Amy Allen, Political Theology Today, 2016. "Two-way Blessing," Melissa Bane Sevier, Contemplative Viewfinder, 2016. "Jesus knew what he was doing when he sent out the seventy in twos. We don't have to go to a foreign country to be on the journey together." "The Lord Sent Them On Ahead in Pairs," Janet Hunt, Dancing with the Word, 2016. "What comes to your mind when you think about who Jesus has sent to walk alongside you?" "Contradictions," Alan Brehm, The Waking Dreamer. "We are called to proclaim the message to one and all: the Kingdom of God is right here. Like Jesus' original disciples, we should not be surprised that some will respond with faith and some will not be willing to give up their allegiance to other kingdoms." "The Urgency of the Harvest," Glenn Monson, Law & Gospel Everywhere, 2016. Commentary, Luke 10:1-11, 16-20, Michael Rogness, Preaching This Week, WorkingPreacher.org, 2013. "Notice how Jesus only tells them what they should do and doesn't say anything about measuring their success. If people don't accept your message, he says, shake their dust off your feet and move on. In our congregations it's difficult to avoid measuring success." The Greater Gift, David Lose, Dear Working Preacher, 2013. "So what might it mean, Working Preacher, if our congregations were to remember Jesus' counsel and command and work and dream together of a more vibrant witness to the Christian faith? What might it mean to think about those things our congregations can do for our communities? Of things we assuredly cannot accomplish alone but might venture together?" "Love among the Wolves," David Sellery, 2013. "Jesus is telling us that love among the lambs is easy. Love among the wolves is hard." "Packing for Jesus' Mission Trip," Alyce McKenzie, Edgy Exegesis, 2013. "It seems to me that he is talking about spiritual pride. He is saying bring your faith and spiritual power along when you come on my Mission Trip, but attribute your successes to God. Leave your ego at home." "Hands for the Harvest," sermon discussion from Frederick Buechner, Frederick Buechner Blog. "Leo Bebb said, 'It's worth breaking the law just so you can get put in the lock-up, where the grapes are ripe for the harvest and the Lord needs all the hands he can get for the vineyard. You should hear the way they sing hymns behind bars, Antonio. Makes you go all over gooseflesh.'" "Proclaiming the Nearness of God's Reign," D Mark Davis, Left Behind and Loving It, 2013. "The response to the scarcity (and danger) of workers is for the seventy-two to go out with their own scarcity and vulnerability – in total dependence on others for food, shelter, drink and protection." "Lambs in the Midst of Wolves," Nancy Rockwell, The Bite in the Apple, 2013. "Cheap grace, [Bonhoeffer] said, expects endless pleasantness, and is unwilling to confront powers and principalities. True grace knows the cross is part of life in Christ." "Getting the Message Out," Ronald C. Neustadt, Crossings, 2013. "The trouble with rejecting the message of mercy is that we are thereby rejecting the One who sent us to deliver that message." "On Satan and Magic," Mark Stenberg, The Hardest Question, 2013. "Go Your Way," Katie Munnik, Presbyterian Record, 2013. Holy Textures, Understanding the Bible in its own time and in ours, Luke 10:1-11, 16-20, David Ewart, 2013. "The joy in following Jesus is NOT in the results; the joy is in our relationship with him." "An Owner's Manual for Missionaries," Janet Hunt, Dancing with the Word, 2013. "Who have been important partners for you in your life? In your life of faith? What has made them so important?" Evangelio, Comentario del San Lucas 10:1-11, 16-20 por Lisandro Orlov, Working Preacher, 2013. Commentary, Luke 10:1-11, 16-20, Marilyn Salmon, Preaching This Week, WorkingPreacher.org, 2010. "Jesus dines frequently, but he never gives a dinner party. 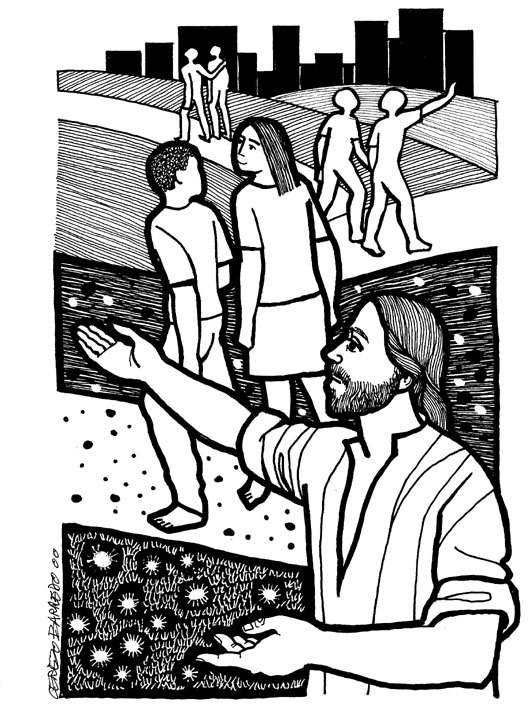 He is always a guest..."
"First Thoughts on Year C Gospel Passages in the Lectionary," Pentecost 7, William Loader, Murdoch University, Uniting Church in Australia. "I wonder if the invitation to join the movement of God?s kingdom does not sometimes work like this. It is not about selling a brand name ('Christian'), but sharing a vision of change in such a way that means real participation in making it real in the here and now." "A word distinction that might be worth mentioning: Sometimes we are "disciples," that is, "learners." Sometimes we are "apostles," that is, "sent out ones." The old illustration of the Dead Sea might apply to some of our people -- all inflow with no outflow -- produces death." Mission of the Seventy, audio telling, story in episodes, graphic, audio and written commentaries. Go Tell Communications, Biblical Storytelling for the Global Village, 2010. "Commissioning the Seventy," Gospel Analysis, Sermons from Seattle, Pastor Edward F. Markquart, Grace Lutheran Church, Seattle, Washington. Detailed background and exegesis. "Historically and even today, why do members of the Lutheran Church and other mainline denominations do such a poor job at evangelism?" "Like Lambs among Wolves: Gospel Reflections on the Temptations of Violence," guest essay by Sara Miles, The Journey with Jesus: Notes to Myself, Daniel B. Clendenin, Journey with Jesus Foundation, 2007. "How have you experienced the temptations of violence?" Dylan's Lectionary Blog, Proper 9C. Biblical Scholar Sarah Dylan Breuer looks at readings for the coming Sunday in the lectionary of the Episcopal Church. "Jesus sends out seventy -- a number of fullness and wholeness -- to exercise authority over every spirit and every condition that oppresses God's children." "Eating What Is Set before You (Luke 10:1-11, 16-20)," Paul K. Palumbo, Word & World, 2001. "Perhaps they need the preacher to preach a reverse-missionary story to let them see how much they feed the souls of others, how much they give to one another and how, in them, I find hope and authority to continue to proclaim good news." "In a day when education is rightly important & valued, how can we respect, appreciate, & use the ministry gifts of the 'infants' among our ranks." "Proclaiming the Gospel of the Kingdom," Rev. Bryan Findlayson, Lectionary Bible Studies and Sermons, Pumpkin Cottage Ministry Resources. Kairos CoMotion Lectionary Discussion, Luke 10:1-11, 16-20, Wesley White. "A place of conversation regarding Progressive Christianity." "Seventy Disciples," "Chorazin," "Bethsaida," "Capernaum," wikipedia. Clarke, Sathianathan, "Global Cultural Traffic, Christian Mission, and Biblical Interpretation: Rereading Luke 10:1-12 through the Eyes of an Indian Mission Recipient," Ex Auditu, 2008. Rah, Soong-Chan, "Response to Clarke," Ex Auditu, 2008. Gill, David H., "Observations on the Lukan Travel Narrative and Some Related Passages," Harvard Theological Review, 1970. Grundmann, Christoffer H., "He Sent Them Out to Heal! Reflections on the Healing Ministry of the Church," Currents in Theology and Mission, 2006. Long, Thomas G., "'Today Is...': A Sermon for Sunday, July 4," Journal for Preachers, 2004. Palumbo, Paul K., "Eating What Is Set before You (Luke 10:1-11, 16-20)," Word & World, 2001. Phipps, William E., "Itinerating Wives and Mary Madgalene," Currents in Theology and Mission, 2006. Willson, Patrick J., "What to Say," The Christian Century, 2007. "Peace and the Cross," Deacon Sil's Homiletic Resources, 2016. "Therefore, Go..." David Lovelace, Day 1, 2016. Changing Plans, the Rev. JC. Austin, Day 1, 2013. "The Nearness of the Kingdom," Christopher Henry, Day 1, 2007. "Two by Two," Pentecost +6, 8 July 2007, Luke Bouman, Goettinger Predigten: Every Sunday Sermons based on the RCL by a team of Lutheran theologians/ pastors. "It All Depends on Jesus," children's sermon, coloring page. Charles Kirkpatrick, Sermons 4 Kids. "Seventy Disciples Go Out and Return," Sunday School Lessons: Family Bible Study, art projects, music, stories, etc. Clip Art, Luke 10:3, Fr. Richard Lonsdale, Resources for Catholic Educators. Clip Art Images: Luke 10:1-20, Luke 10:1-20 #2, Misioneros Del Sagrado Corazón en el Perú. Luke 10:1-9 at Cerezo Barredo's weekly gospel illustration. Liberation emphasis. Hymns with Scripture Allusions: Luke 10:2. The Cyber Hymnal.